A few months years ago [Wes] shared a project of his on the Hackaday Forums (yes, we do have a forum and you should check it out). He created a shifter for some sim racing, greatly improving on any system that uses a keyboard. 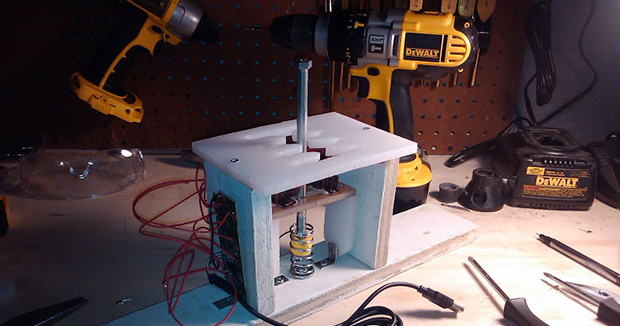 The shifter is made out of some scrap wood, a cutting board cut with an H-gate shape, and a few arcade microswitches. A giant bolt locks into a few cabinet clasps for each gear position, and the set of microswitches connected to a USB game pad tell [Wes’s] virtual car what gear he should be in. It’s a great build, but because this is an entry for our Fubarino contest, [Wes] needed to put an easter egg with the Hackaday URL in there somewhere. To solve this problem, [Wes] upgraded the electronics with a Teensy 2.0. When the gears are shifted into 1st, 3rd, 3rd, and 7th, the Teensy blinks the URL in Morse and opens up a web browser that loads up Hackaday. Not only is it a great build, it’s also a very, very subtle easter egg for our favorite website. Demo of the egg below. This is an entry in the Fubarino Contest. Submit your entry before 12/19/13 for a chance at one of the 20 Fubarino SD boards which Microchip has put up as prizes! Is the cabinet clasp a common part of home-made gear shift mechanisms, or was that Wes’s own ingenuity? Either way that is a pretty clever idea. Looks like the whole build is pretty simple and effective. It is a clever design. He mentions in the write up that he got the idea from someone else on a forum, but it’s still a really clever idea :) The funny part is, I bought a few of those exact same clasps from Home Depot about 4 years ago, but I never got around to building a shifter (I bought a real race car right around that time and stopped sim racing, pretty much..). I can’t remember, but I either read the same post he did and got the idea from that, or I might have made the post myself! This is awesome, either way, I’m glad it seems to work really well! Months? The post on the forum was from 2011, and it was featured on the website around the same time. It still is a cool hack, but these over sights happen all to much. Since we’re being pedantic, years and months are directly convertible at the rate of 1:12, so the original was still technically correct. Useless comment here, but he sure loves his DeWalt. I’ve starting buying more DeWalt stuff recently too, seems to be decent enough quality. But I am a wired guy, not cordless for me. That’s a nice shifter, and smartly made. I presume the upper template could be replaced or further restricted to limit number of gears. He mentions two modes of operation (H-box and sequential), but not how the ‘grips’ are disabled. How about making the yoke (with grips) rotate by 90′ to prevent them gripping?